The application process lasts anywhere from 1. 5 to 3 hours depending on the length and thickness of the hair. Plus 50ml Clarifying Shampoo. (Original Bottle). COCOCHOCO PURE. The application process lasts anywhere from 1. 5 to3 hours depending on the length and thickness of the hair. Wash the hair twice with COCOCHOCO Clarifying shampoo. Shake the product bottle well before application. / Each tuft to which the Capilar Surgery is applied should be dried with the dryer, then remove the next tuft, apply the keratin and dry with the dryer, until applied to the whole hair in the form of a dye (DRYING MUST BE DRIED PROFESSIONAL, NOT WITH IRON DIRECTLY). La cirugía capilar KeraFruit es un tratamiento que ofrece la posibilidad de recuperar el cabello del daño ocasionado por la exposición solar, los tintes, la decoloración y otros tratamientos químicos. Qu'est-ce que la taninoplastie ?. Il s'agit d'une nouvelle technique naturelle de lissage des cheveux qui tire profit de substances appelées tanins, d'où le nom de cette technique. Les tanins sont des polyphénols d'origine végétale qui sont obtenus grâce à la macération de la peau du raisin, du châtaigner et du chêne. Kit Lissage Brésilien Eternity liss Perola. Ainsi, a été développé Eternity Liss, composé à base de kératine active et Cystéine, qui traite les cheveux en les laissant en bonne santé, l'intensification de la brillance naturelle des cheveux et en leur donnant un effet lisse. Kera Fruit Capilar Surgery has the function of smoothing the hair, providing the lost shine and achieving the look of a naturally beautiful hair. (SHAMPOO 1 LITRE AND CAPILAR SURGERY 1 LITRE). PRESENTATION OF 1 LITRE. Die Behandlung kann eine allergische Reaktion hervorrufen. Der Hautempfindlichkeitstest sollte 48 Stunden vor der Anwendung durchgeführt werden. Es wird nicht für Kinder unter 12 Jahren und für schwangere und stillende Frauen empfohlen. Brasilianische Keratinbehandlung enthält FORMALDEHYDE NICHT. Schützt das Haar vor strukturellen Schäden. Macht das Haar mit jeder Behandlung glatter und gesünder. Verkürzt die Stylingzeit und ermöglicht ein einfacheres Föhnen. Taninoplastie capillaire. Qu'est-ce que la taninoplastie ?. Il s'agit d'une nouvelle technique naturelle de lissage des cheveux qui tire profit de substances appelées tanins, d'où le nom de cette technique. Kera Fruit Keratin Strong has the function of smoothing the hair, providing the lost shine and achieving the look of a naturally beautiful hair. (SHAMPOO 1 LITRE AND CAPILAR SURGERY 1 LITRE). PRESENTATION OF 1 LITRE. KERASTASE FUSIO DOSE CONCENTRE PIXELIST. Kerastase Fusio-Dose CONCENTRE PIXELIST. Micro-Emulsified Fibrionic System instantly smoothes the hair fiber, prolonging the shine and brilliance of color-treated hair. Nu Skin ReNu Hair Mask. 100% Authentic - The More You Buy, The More You Save! It's for all kind of hair and the best for people with very challenging waves/curls. If you have very thin hair or less challenging waves/curls you can try the Brazilian Blowout ZERO Plus. 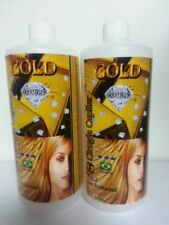 1 oz - Brazilian Blowout Original Professional Solution. I'm always here to help you with anything you may need. 3 Weeks Of Product. *PURE ORGANIC Cold Pressed UNREFINED ARGAN OIL - DIRECT FROM MOROCCO!! Total of 16oz. Total 16oz. Twenty 0.8oz Bottles. Product Details. Orofluido Hair Beauty Elixir boasts a delicious amber fragrance grounded in an aromatic vanilla foundation, transporting you into a fascinating world of oriental scents. Featuring argan, cyperus and linseed oil your hair will be left beautifully light and incredibly silky. It's for all kind of hair and the best for people with very challenging waves/curls. If you have very thin hair or less challenging waves/curls you can try the Brazilian Blowout ZERO Plus. ½ oz - Ionic Bonding Spray (Step 3 Substitute or Maintenance ). If other products for frizzy, curly hair have made your curls heavy and unmanageable, you’ll love TIGI’s Bed Head After Party Smoothing Cream. We are very serious against false claims. Any attempts with intend to manipulate our system will result in appropriate repercussions. BRAZIL CACAU KERATIN KIT. The acid pH(2.8) of Brasil Cacau Keratin and the heat of the flat iron are responsible for fixing the formula’s active ingredients into the hair. It realigns the cuticles, making the hair surface even and smooth to reflect light and imparts brilliant shine. Our proprietary formula penetrates deep to the hair’s core. The 1 ounce bottle contains enough to last for months! It has a low molecular weight so that it can work it’s way down to the cortex and protect the hair shaft from breakage by replacing the hair’s lost protective cuticle. non é cheratina, è Cisteina Kiss Liss, senza formaldeide. 4 I would like to cut my hair as well. When should I do this?. 3 I want to also color my hair. It depends on your preference and individual hair type. Results will last up to 4 months. 11 What shampoo should I use to maintain my beautiful hair?. 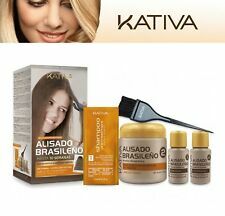 Kativa - Brazilian straightening kit. Applicarlo due volte e risciacquare. Lavare i capelli con lo shampoo e il balsamo inclusi nel kit. Risciacquare e procedere con la piega desiderata. Lasciar agire per 15 minuti. Shine, defrizz and add the perfect finishing touch. Use with a round brush for a smooth blow-out. Use with a curling iron to get smooth curls or waves. Color safe & free of Gluten/Parabens/Sulfates - Safe for all hair types. Our fave ways to use. Total of 16oz. This hair shampoo does more than just clean. Your hair will have added value and be shiny, healthy and full of life. Your hair never felt so good. Product Details. 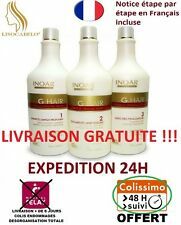 Lait de Lissage cheveux fins STEAMPOD. Le lait de lissage Steampod s'utilise avec un lisseur vapeur pour un résultat parfait. Soin vapo-activé par le lisseur Vapeur Steampod. Soin vapo-activé régénérateur de la fibre capillairedédié aux cheveux fins. 34 oz. Farouk Biosilk Silk Therapy Conditioner. 1,000ml. Liter. FREE SHIPPING. 5.64 oz. Farouk Biosilk Silk Therapy Serum. 150ml. NEW. FREE SHIPPING. 3 PACK. 11.6 oz. Farouk Biosilk Fruit Cocktail Reconstructing Treatment. 300ml. 6 oz. Farouk Biosilk Silk Therapy Gel. 150ml. NEW. FREE SHIPPING. 5 PACK. 11.6 oz. Farouk Biosilk Silk Therapy Conditioner. 300ml. FREE SHIPPING.